Parents Pete and Jayne from Hollywood in Birmingham were overjoyed when they had their first child. But when baby Joseph was just 12-weeks-old, his parents noticed that his head wasn’t the normal circular shape. In fact it was completely flat at the back. Concerned about this abnormal appearance, Jayne contacted a number of health professionals for advice. In total, they spoke to three separate doctors, two health visitors and two midwives about their son’s condition. Not one of these people could offer advice on how to treat Joseph’s problem. In fact, Jayne recalls how they were told that his head would ‘pop out’ in time, and a doctor even calling them ‘obsessive’ parents, telling them that they were worrying unnecessarily. Like many new parents today, Pete and Jayne looked on the Internet for advice. It was here that they discovered information on Technology in Motion centre in Leeds, where babies are treated for Plagiocephaly, a condition also known as flat head syndrome. Peter and Jayne made an appointment at the centre and during their first visit the cranial remoulding specialist confirmed that Joseph was suffering from Plagiocephaly. He began the Cranial Remoulding Helmet treatment aged seven-months-old. The treatment involves the infant wearing a specially fitted Cranial Remoulding Helmet helmet, which helps to mould the skull to a circular shape as the baby grows. The helmet is usually worn for 23 hours a day and treatment can last from a few months to over a year, depending on how quickly the child’s head grows. Pete and Jayne were overjoyed at the results that were achieved with Joseph’s skull shape. When his treatment had ended, the couple decided to have another child and soon, Sophie was born. Due to the family having had the experience of Plagiocephaly in the past, they decided to keep a watchful eye on their daughter’s head shape. At four-weeks-old, the parents noticed a change in Sophie’s head that looked similar to her brother’s previous condition. 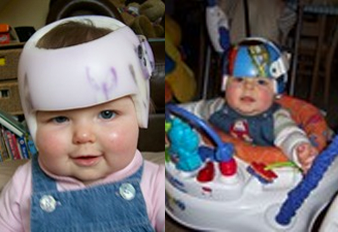 As the parents didn’t want to get in touch with the NHS staff who had disregarded Joseph’s Plagiocephaly, the couple decided to contact the Technology in Motion centre first, for their opinion on their little girl’s condition. Their appointment a few days later confirmed that Sophie had also developed flat head syndrome, and she began treatment a few weeks later. For cranial remoulding specialist Steve Mottram, this was the first set of siblings he had ever treated. Steve said: “Considering that 1 in 30 babies suffer from Plagiocephaly in the UK, it’s surprising that this is the first case of siblings I have treated. During his treatment Joseph responded really well to the Cranial Remoulding Helmet, and it appears that we will achieve them same success with Sophie”, he added.